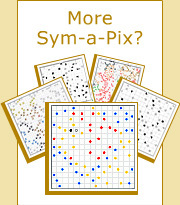 Sym-a-Pix puzzles can be played interactively on the computer, offering many features and advantages compared to pencil and paper. This section explains everything about how to play Sym-a-Pix on the computer. If you are not yet familiar with the puzzle rules, please go to Sym-a-Pix rules. Sym-a-Pix interactive is played by drawing walls on the grid. First click on the grid draws a wall and the second click removes the wall. Multiple walls may be drawn or removed by dragging the mouse. Marking squares is a useful feature to show which squares belong to a specific dot. First click on a square marks it with X and the second click removes the X. Multiple squares may be marked or cleared by dragging the mouse. All marks in the grid may be cleared by clicking the Clear marks button on the toolbar or using Delete or Spacebar on the keyboard. When all walls surrounding a dot are completed, the block is painted according to the color of the dot (if the Paint completed blocks preference is checked) and a sound is activated. When the last block of the puzzle is completed correctly, a congratulations message together with a thumbnail of the puzzle will pop up. Check all walls for errors. Clear all X marks in the grid. Auto solve starting points: Check this box to automatically draw walls between adjacent squares containing dots or fractions of dots. Paint completed blocks: Check this box to paint a block when completed. Auto complete symmetrical walls: Check this box to automatically draw walls adjacent to a dot according to the rule of rotational symmetry. Open How to play Sym-a-Pix page you are reading now.